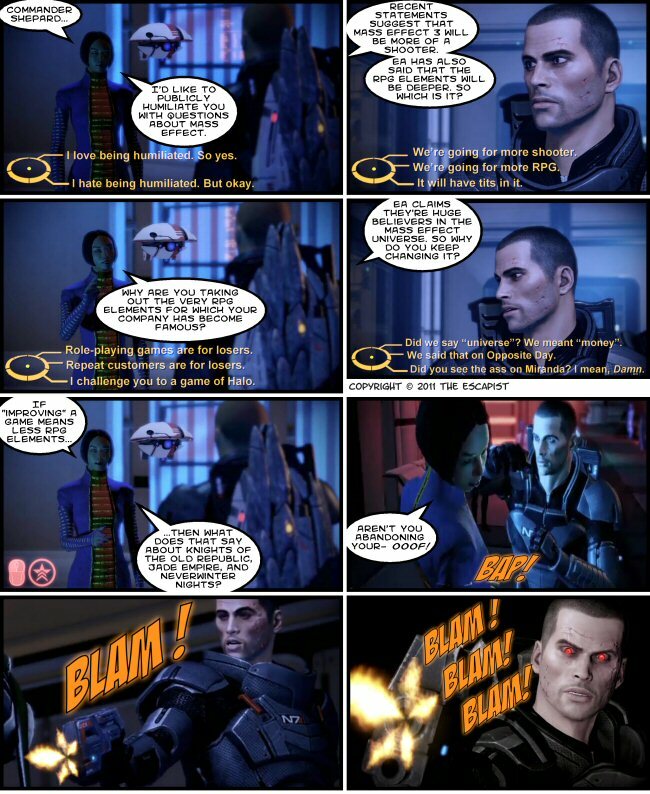 EA has been saying lots of things about Mass Effect 3. Sometimes the things they say contradict their comments made on another day. Sometimes these contradictions take place within the same sentence. For example, "We're huge believers in the IP and are purposefully shifting it to address a larger market opportunity." So, they believe in the product, which is why they're changing it. People have said that since some of these statements were made to investors, we should ignore what they were saying. But that's not a more positive way of looking at things, it's only a different sort of bad news. We're now pinning our hopes on the idea that EA executives are only pretending to betray the previous two games in order to appease investors. I don't know if that's all that encouraging. Do we really want to pin our hopes on the idea that the people driving the project are liars? No matter which interpretation you go with, they do not stand behind their earlier work. So this is EA's bold new vision for BioWare: To shoehorn this story-and-character-driven developer into the already crowded shooter market. Truly, these people are visionaries.